An architectural mystery, from C.W. Farrier, "Home, Sweet Home of Tomorrow?" Popular Mechanics (Sep., 1932), p.353. What is this image? What, exactly, are we looking at? Who made it? When was it made? Keeping with the language of the mystery genre, I look to Martin Amis' London Fields as inspiration here. Samson, the main narrator of that novel describes the tale he is about to unfurl as "Not a whodunit. More a whydoit." The same applies to the mystery surrounding the above image. In other words, it is not the "what is it?" that is important, but the "why did it happen?" That is not to say, however, that the "what is it?" is not worth our efforts. At first glance, we can be fairly comfortable with identifying the above house as modern. Its flat roofs, white (plaster?) surfaces, and large, intersecting volumes suggest a large single-family residence — we could even argue that the house evokes projects by Irving Gill or even anticipate those by Gregory Ain. For example, the house's size and volumetric arrangements suggest something in the order of Gill's Walter L. Dodge House (1914-16). And except for a ground-level protrusion including a garage, bedrooms, and a pool, and despite an intentional lack of detailing or overhangs, Gill's most famous project could bear a striking resemblance to the above house. Again, the interplay of volumes and horizontal glazing on the second floor seems like a distant echo of Ain's Dunsmuir Flats (1937). Notice the large, window glazing with its distinct checkerboard panes. We've seen this before. In fact, Richard Neutra used a similar kind of window in the entrance of his Lovell (Health) House (1927-29). 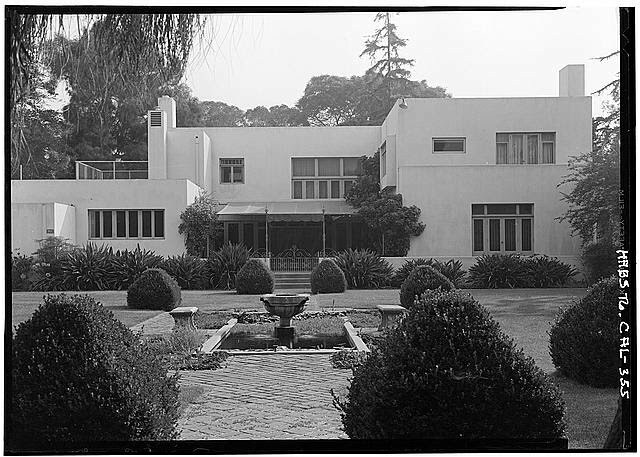 Architectural sleuths with a predilection for historical materials will recall quickly that a model and photographs of Neutra's house appeared in Modern Architecture — International Exhibition, the iconic 1932 show at the Museum of Modern Art (MoMA) in New York that introduced what would be known as the "International Style in Architecture." One could even say that the above mystery house is an example of this style. Hold on to that thought. Viewing the image in its proper context reveals additional layers of complexity. Should we zoom out from the above image, we will notice that it is a photograph from the front page of the September 1932 issue of Popular Mechanics. Started in 1902 by Chicago publisher Henry Haven Windsor, Popular Mechanics was a publication aimed at bringing the latest advancements in science and technology to a mass audience. The slugline under the title — "Written So You Can Understand It" — is perhaps the best testament to this point. And so is the title of the lead article. Is this truly the "Home, Sweet Home of Tomorrow?" The question mark is an invitation for Popular Science readers to judge whether this is the case. We could also ask the couple who is looking at the model of the house. They are the very image of a marital division of labor. The wife looks happy. The husband appears consumed in thought. The wife smiles while imaging her life inside the house. The husband is figuring out whether the car (a dead ringer for a Walter Dorwin Teague design that would be featured in the October 1932 Popular Mechanics) fits inside the garage. Housekeeper and breadwinner are caught in the act of contemplating architecture. This is all hyperbole, of course. But so is the caption to the image. It reads, "Model in Exhibit of Museum of Modern Art, New York." Those with a careful eye will note the exact wording of the caption. After all, we are looking at a "Model in Exhibit of Museum of Modern Art," not a "Model in Exhibit at Museum of Modern Art." Considering the year in which this article was published, and judging by the kind of architecture that is being presented here, this would be a reference to MoMA's 1932 Modern Architecture exhibition. Identifying the model as something that was "of" as opposed to "at" MoMA amounts to some hair-splitting, sure. But there is a reason for emphasizing this distinction: this house never appeared at the 1932 MoMA show. Model of Le Corbusier's Villa Savoye displayed in Hitchcock and Johnson's Modern Architecture - International Exhibition show at the Museum of Modern Art, New York, 1932. Curators Philip Johnson and Henry-Russell Hitchcock originally intended to write a book detailing the contemporary landscape of architectural modernism. This changed during the summer of 1930, when at the behest of Alfred H. Barr, Jr., the two took a trip to Europe to survey architects and projects to be included in an exhibit about modern architecture. It was during this trip that Johnson and Hitchcock met many of the architects who would eventually end up in their show. 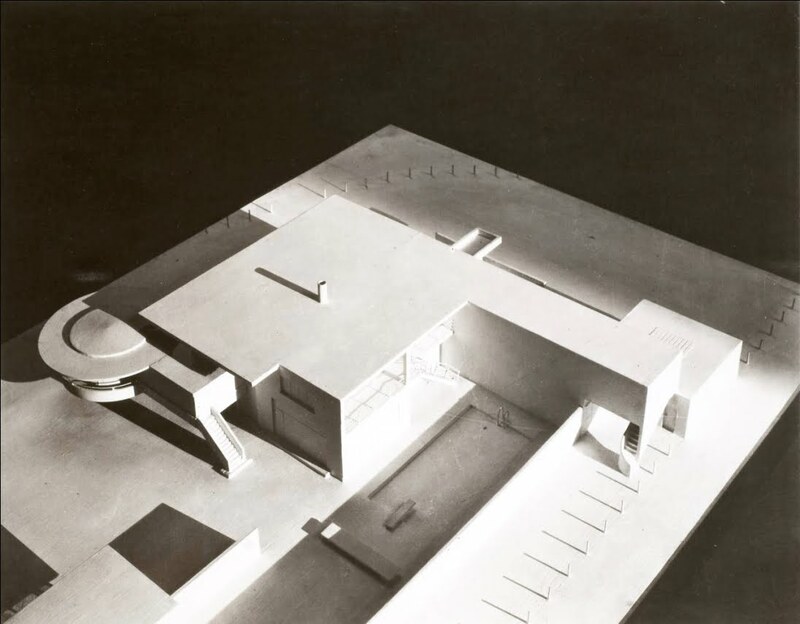 And after two years of clashing over content, of hammering out different versions of the show (including earlier iterations which were to include work by Norman Bel Geddes), the result was an exhibition of photographs and architectural models that was as polemical as it was popular. As demonstrated by the floor plan of the resulting Modern Architecture-International Exhibition at MoMA from 10 February to 23 March 1932, the Popular Mechanics model is nowhere to be seen. It bears mentioning that Johnson and Hitchcock organized their models and photographs according to three general areas. The first, entitled "Modern Architects," featured the work of modernist luminaries such as Le Corbusier and Ludwig Mies van der Rohe as well as a coda-like addition focusing on the work of Raymond Hood and Neutra. The second part, "The Extent of Modern Architecture," showed how aspects of architectural modernism were present in the work of European, American, and Asian architects. The third, and most contested part was simply labeled "Housing" and contained photographs and site plans of works selected by Catherine Bauer, Lewis Mumford, and Henry Wright. All of these sections featured models, including: J.J.P. Oud's House at Pinehurst, Le Corbusier's Villa Savoye, Mies' Tugendhat House, Frank Lloyd Wright's House on Mesa, Otto Haesler's Rothenburg Siedlungen, Walter Gropius' Bauhaus, the Bowman Brothers' Lux Apartments, George Howe's and William Lescaze's Chrystie-Forsyth housing, Hood's Tower in the Country, and Neutra's Lovell (Health) House. Again, in addition to a passing, superficial similarity to Neutra's house, different aspects of the Popular Mechanics house echo some of the models in the exhibit. We see, for example, the same kind of overhangs and windows as in Oud's Pinehurst House, as well as the volumetric play defining Oak Lane Country Day School. These, again, are very knee-jerk similarities, but it is important to note these — Popular Mechanics readers could make these very same associations. And they did. The September 1932 issue of Popular Mechanics was heavily annotated by a very informed reader. (In fact, all issues available on Google Books were annotated by the very same reader.) Note, for example, the extensive penciled marginalia surrounding the image of the "Home, Sweet Home of Tomorrow." Along the gutter, on the left-hand side of the page, a handwritten scribble reads, "Probably designed by A. Lawrence Kocher and Albert Frey ..." (an address label covers the rest). 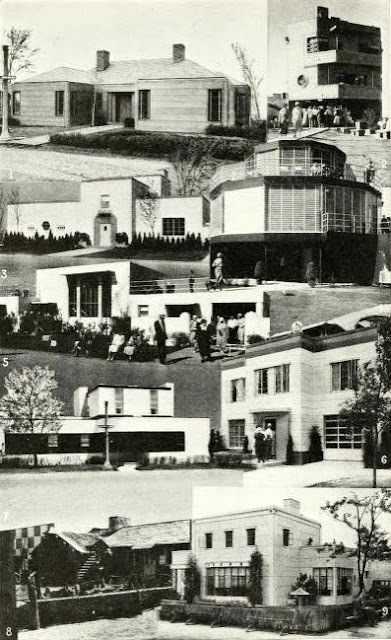 Reader's caption identifying the "Home, Sweet Home of Tomorrow" as Lawrence Kocher's and Albert Frey's Aluminaire House. A. Lawrence Kocher and Albert Frey, Harrison (Aluminaire) House, 1930-31: (top) southwest corner; (middle) northwest corner; (bottom) drawing of west elevation (Source: Joseph Rosa, "A. Lawrence Kocher and Albert Frey, The Aluminaire House, 1930-31" Assemblage, No. 11 (Apr., 1990), pp. 58-69. The reference here is to the very same Kocher and Frey whose Harrison (or Aluminaire) House appeared in the both the Architectural League's 1931 Allied Arts Show and MoMA's 1932 Modern Architecture exhibition. The house, assembled out of found and prefabricated light steel and aluminum elements, was one of the earliest examples of modern architecture to be found on the East Coast. The Aluminaire House also had some serious architectural pedigree. 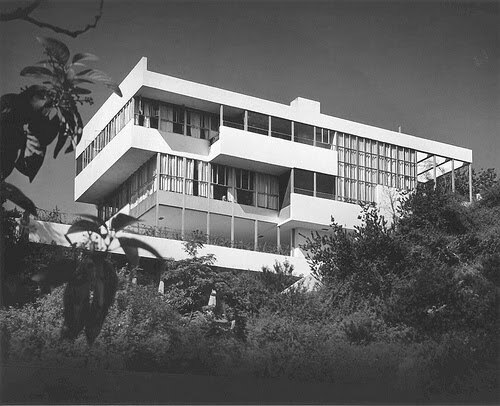 Not only was it considered an exemplar of the "International Style" by Hitchcock and Johnson, but it was designed by Frey, a former employee of Le Corbusier's who from 1928 to 1929, worked on signature projects such as the Villa Savoye at Poissy, the Cité de Refuge, in Paris, and the Centrosoyus in Moscow. "Cut-Away" drawing of Kocher and Frey's Aluminaire House from the August 1931 issue of Popular Mechanics. Note the reader's annotation at the very top identifying the image as the Aluminaire House. And how, exactly, did this reader know about Kocher and Frey or the Aluminaire House? It is very likely that this reader once looked at an article the August 1931 issue of Popular Mechanics called "The Home of The Future." 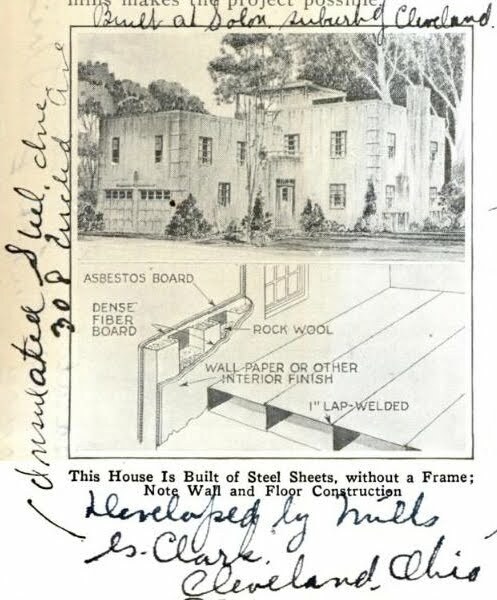 And indeed, looking at the Google Books version of the article not only reveals a very detailed (and labeled) drawing of the Aluminaire House, but also shows the very same handwriting as in the September 1932 issue. Here, the reader writes in the same script as before, "designed by A. Lawrence Kocher and Albert Frey, 4 Park End Place, Forest Hills, Long Island, NY" (with an accompanying note referencing the September 1932 issue). The question is, when did the reader look at the August 1931 issue? 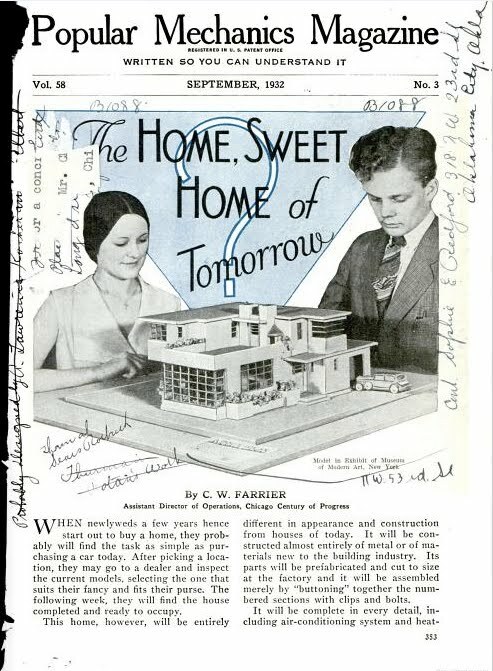 Judging by the fact that the reader strikes through his or her scribble in the September 1932 issue, we can guess that the author, though familiar with the MoMA exhibition, thought that the "Home, Sweet Home of Tomorrow" was the Aluminaire House. Once he or she looked at the October 1931 issue, he or she realized the mistake and struck through the reference. This graphological detour still leaves an important question unanswered. What inspired this reader to recall the Aluminaire House? What made him or her say, "Ahh, that looks like Kocher and Frey's Aluminaire House"? Perhaps a visit to the MoMA show informed this opinion. There are, however, two plausible explanations. On the one hand, there is a bit of a formal similarity between the "Home, Sweet Home of Tomorrow" and the Aluminaire House. Here, I am of course talking about the gridded window glazing: it appears both the cutaway drawing from the August 1931 issue and the model in the October 1932 issue. The glazing also appears in roughly the same area of the image (on the left-hand corner of the model). When comparing the two images, it it possible to see how this kind of glazing becomes a dominant feature for both projects, even if both are proportioned differently, and even if the windows are located in different areas relative to the rear façades of each building. On the other hand, our unidentified reader may have seen the MoMA show in Chicago. In 1932, the Chicago-based Association of Arts and Industries (the precursor the the New Bauhaus as well as the Art Institute of Chicago), an organization whose object was to "stimulate the application of art to the industrial and aesthetic development of the country", sponsored a traveling version of the show. 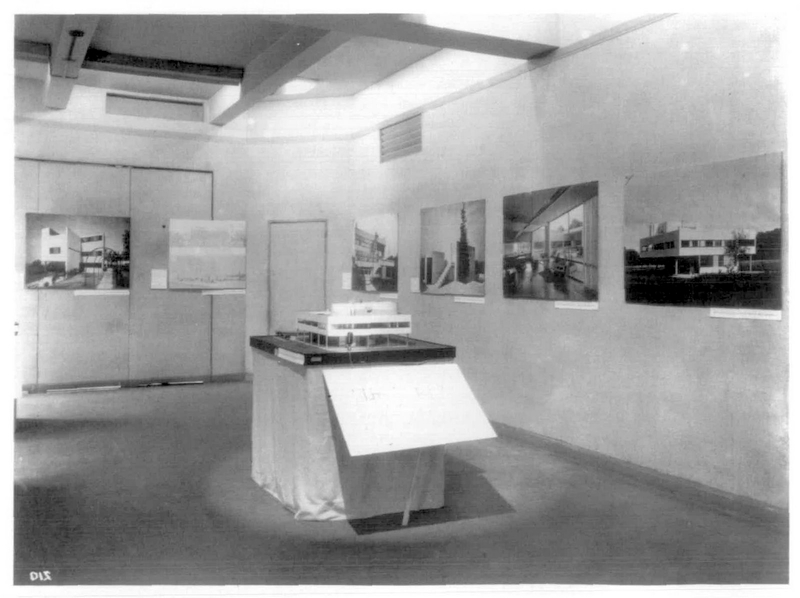 Held at the exhibition gallery of the new Sears, Roebuck store from June 9 to July 9, the traveling version of the Modern Architecture exhibition featured many of the same models and photographs as in the New York version. And indeed, our reader noted near the bottom of the "Home, Sweet Home of Tomorrow" article that the Popular Mechanics mystery model was "shown at Sears Roebuck." This leads to the conclusion that a photograph of the Aluminaire House was shown at Sears, Roebuck during the summer of 1932. But assuming that indeed this building was part of the exhibit, there is always the question of why the reader would think that Kocher's and Frey's house was important. In other words, the Aluminaire House was significant for our reader — so much so that he or she went to a lot of trouble to document its origins and pedigrees in the margins of a popular magazine. There is always the possibility that we are overstating the importance of Kocher's and Frey's house. 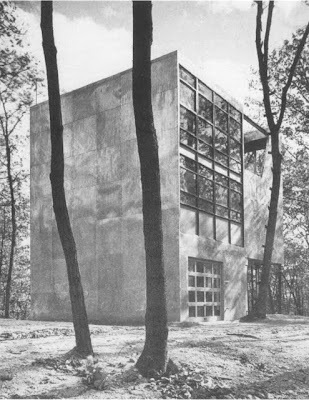 It is true that the Aluminaire House was a significant example of modernist architecture. But to impart this interpretation on our reader may be asking too much. Was he or she really aware of current developments in architecture culture? Perhaps. But then again, there is something about the degree to which this reader was informed about specifics that leads us to think that this was no average reader. Why is this so? It has everything to do with the Popular Mechanics. As it turns out, the August 1931 and October 1932 issues were involved in their own kind of architectural polemic —one that competed with, if not contravened, ideas about architectural modernism present in the MoMA show. "Home, Sweet Home of Tomorrow?" was written by C.W. Farrier, one of the organizers of the 1933-1934 World's Fair in Chicago. Called the "Century of Progress Exposition," the Fair was a showcase for cultural, scientific, technological, and even architectural innovations. The architecture of the buildings and grounds in 1933 will illustrate in definite form the development of the art of architecture since the great Fair of 1893, not only in America but in the world at large [...] New elements of construction, products of modern invention and science will be the factors of architectural composition. Artificial light, the tremendous progress of which has astonished all designers in recent years, will become an inherent component of the architectural composition. The extraordinary opportunities of the site for the use of the water as an intrinsic element of the composition will be developed to the maximum. Mr. Urban's color palette consisted of twenty-three colors, all of the brightest intensity. They were: white; sulphur yellow; chrome yellow; bright orange; dull Persian orange; dull vermillion (almost terra cotta); bright vermillion; blue carmine; tomato bisque pink; brown red; greenish blue; peacock blue; true blue; ultramarine blue; dull dark blue; emerald green; peacock green; turquoise blue; blue gray; black, aluminum, gold and grey. Seldom were more than five of these colors used on any one building, and usually only three or four. Approximately twenty percent of all surface was in white, twenty percent in the blues, twenty percent in the oranges, fifteen percent in the black, and the remaining twenty-five divided among the yellows, reds, grays and greens. Solid colors were designed to emphasize the building block system, for the style of the architecture required firmness of treatment in harmony with the definiteness of its unornamented form. Resolving architectural inconsistencies by applying a twenty-three color palette may have seemed a little misguided, and certainly Urban thought so. When used to illuminate the many water displays and building surfaces at night, many of the colors failed to achieve the desired effect. And once the Exposition reconvened in the Summer of 1934, Urban introduced a smaller, more consistent and calculated color palette. 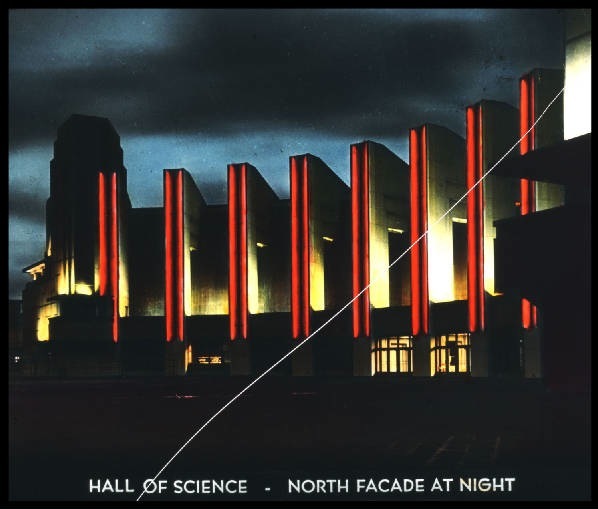 As visitors walked from the North Entrance to the various exits, they would experience a spectrum of greens, reds, blues, and oranges all accentuated through the use various lenses, flourescences, gels, as well as the occasional projection of shadows on white surfaces to accentuate architectural form. In all, it was a spectacular strategy that relied on light effects and atmospherics in order highlight the Exposition's many corporate sponsors. Century of Progress organizers also opted for a more "tangible" display of architecture, one that channeled the same kind of energy on atmospherics and effects towards an exhibition of building techniques. This would be the responsibility of the Home Planning Group, a branch of the Home and Industrial Arts Committee dedicated to the design and construction of single-family residences, all using prefabricated components and featuring the latest dishwashers and air conditioners. Robert Smith, Jr. (ARMCO), Frameless Steel House, Cleveland, OH, 1932 (Source: Farrier, "Home, Sweet Home of Tomorrow", p. 354). Note the various annotations indicating the parties involved in the construction of the house. In the past two years groups have been experimenting with steel homes in one form or another [...] Without a doubt, the frame of the house will be of metal, though not necessarily of steel. It will be rustproof and light in weight, whether it is stainless steel, aluminum or some other metal. The walls will be about three inches thick instead of from twelve to eighteen inches. The outer walls may be of colored enamel material made in sections that clip to the frame. Inner walls will be attached to metal lath and may be of enameled metal, plasterboard, or precast plaster [...] Windows will be more to see out of than to admit light. Illumination will be by neon tubing or ultraviolet tubing emitting therapeutic rays and these will be concealed in walls or ceilings. To illustrate this "future trend in building," Farrier included an image of a "Metal House" erected in Cleveland. Set against a wooded glen, the house consists of two main cubic volumes, with a covered terrace set atop the larger one of these. Faint vertical lines suggest the existence of metal paneling, as does the graphite color — indications that we are not looking at a house made from ordinary building materials. To get a better sense of what this house is, as well as who made it and why it was constructed, we can again rely on the various annotations made by our reader. And in looking at the top margin, we notice that our reader wrote down the citations for two issues of Popular Mechanics: the May 1932 and April 1933 issues. Indeed, the same image of the same house appears in the May 1932 issue. Image of Smith's Frameless Steel House from the May 1932 issue of Popular Mechanics. Here, however, we see the fruits of our reader's endeavor. He or she has not only marked the location of the house ("Built at Solon, Suburb of Cleveland"), but has also identified the house as a "co-op" project by the Insulated Steel Floor and Wall Company and the American Rolling Mill Company (both Ohio-based). The reader also identifies Mills G. Clark as the designer. 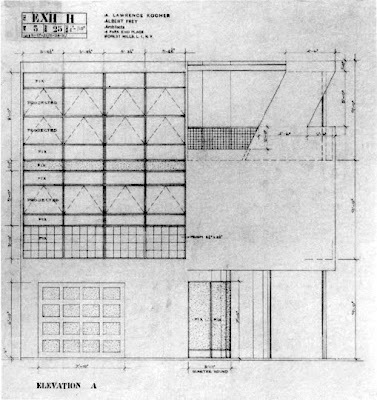 Known by the acronym ARMCO, American Rolling Mill Company sponsored the design and building of a frameless steel and enamel paneling house at the 1933 Century of Progress Exposition. They enlisted the services of Clark and Cleveland architect Robert Smith, Jr. to design the "Armco-Ferro-Mayflower House." Like the house in the May 1932 issue of Popular Mechanics, the Armco-Ferro house evoked a non-metallic look. Porcelain enamel (provided by the Ferro-Enamel Company) was applied to the metal surfaces to create a "softer" look that could also be painted. 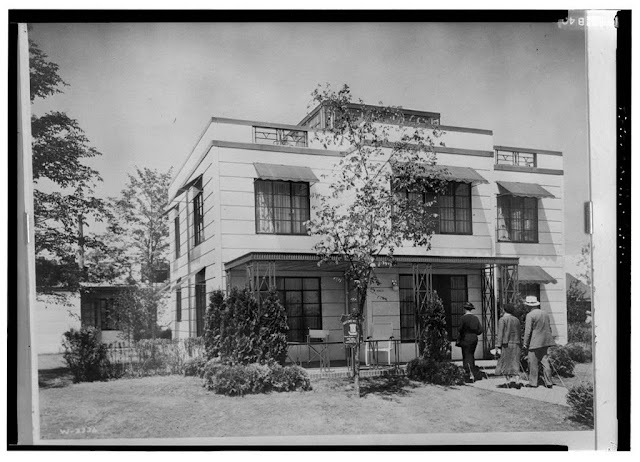 In fact, the house depicted in the May 1932 Popular Mechanics was the first frameless steel and enamel paneling house. 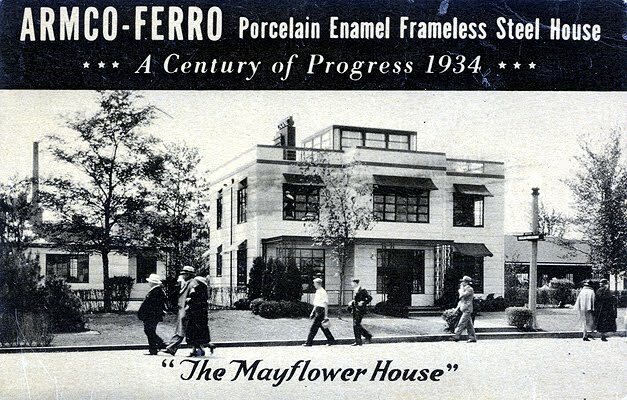 It too was designed by Robert Smith, Jr.
At a first glance, the Armco-Ferro-Mayflower house also seems a modern. Its flat roofs, volumetrics, and unornamented, white surfaces certainly recall several of the projects that introduced this piece. 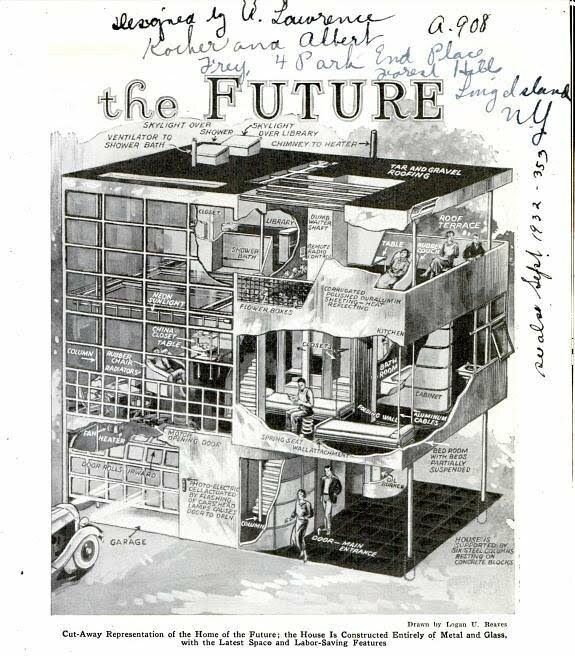 However, it bears some similarities to the "Home, Sweet Home of Tomorrow" from the September 1932 Popular Mechanics that will draw us closer to the "whydoit"and help us understand more of the circumstances leading to this house. The "Home, Sweet Home of Tomorrow" and the Armco-Ferro-Mayflower houses, for example, both rely on symmetrical forms and heavy bases which would place them squarely within a Art Deco tradition. Both houses also have similar kinds of windows. The Armco-Ferro house, however, used casement windows. Judging by the arrangement and location of the windows (note the absence, for example, of strip-glazing), it is quite possible that the "Home, Sweet Home of Tomorrow" may have also used casement windows. We may never know. Another aspect of the "Home, Sweet Home of Tomorrow" bears mentioning, and that is its title. Popular magazines devoted to contemporary architecture trends almost always evoked the idea of a "home of tomorrow" in order to promote their ideas about domestic living. In addition to the September 1932 issue, the August 1931 issue featuring the Aluminaire house was titled "The Home of The Future" (it too promoted the upcoming Century of Progress Exhibition). 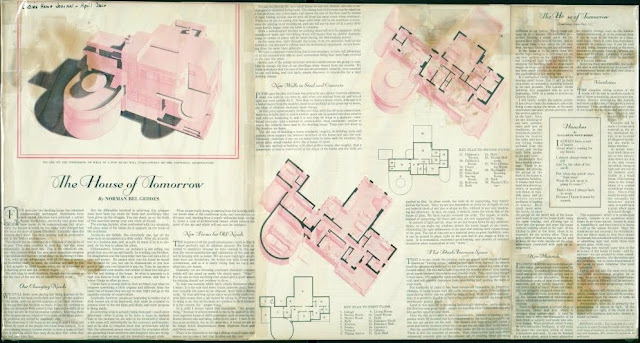 And in the 1931 issue of Ladies Home Journal, Norman Bel Geddes introduced his "House of Tomorrow," which was an early rendering of his "House No. 3" (1930) which would appear later in Horizons (1932), his first book. This house, with its asymmetrical plan, terracing, and circular port is certainly similar to J.J.P. 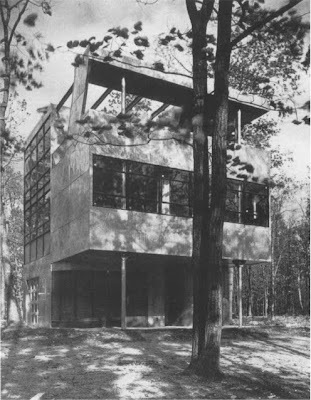 Oud's Pinehurst house from the 1932 MoMA Modern Architecture show. 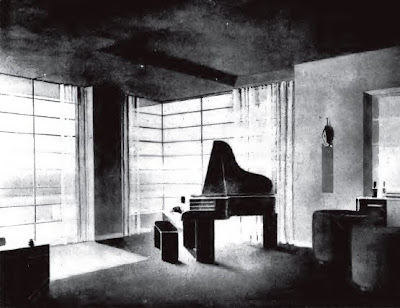 But it is Bel Geddes rendering of the interior that should really capture our attention. Here, we see a sparsely-outfitted studio complete with grand piano foregrounding a set large floor-to-wall windows – a gridded glazing that we have seen before, from Neutra's Lovell (Health) House, to Kocher and Frey's Aluminaire House, to William Lescaze's Roy Spreter Studio (1934), and even the "Home, Sweet Home of Tomorrow." In other words, such use of windows and forms was not just an evocation of the future potential for domestic architecture. It was also a demonstration of how new construction techniques, whether through steel framing or frameless steel, could allow for such embellishments. More importantly, it is an instance of how ideas about architectural modernism were being commercialized and presented to the general public via popular magazines like Popular Mechanics and Ladies Home Journal. Our enterprising Popular Mechanics reader, for example, may have seen Kocher and Frey's Aluminaire House at Sears, Roebuck in 1932. 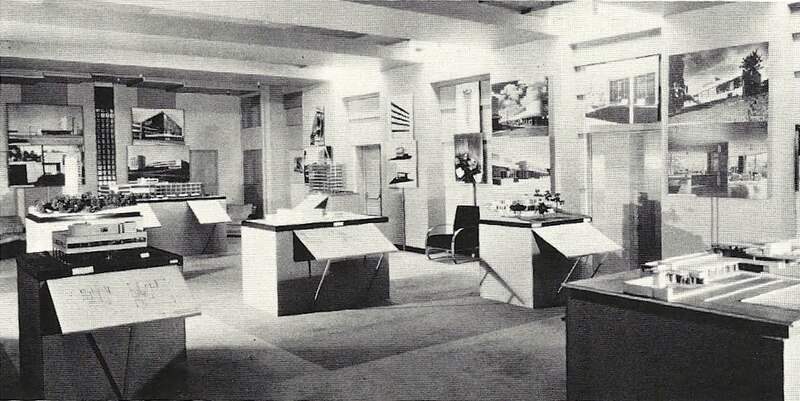 It is worth mentioning that when planning the traveling version of the Modern Architecture show, Hitchcock and Johnson included department stores and showrooms as venues. One of the most well-known photographs of the exhibit, for example, is not from the version shown at MoMA, but rather of the condensed version shown at Bullocks-Wilshire Department Store in Los Angeles from July 23 to August 30, 1932 (the previous installation was at Sears, Roebuck in Chicago). A complicating landscape emerges, one where museums, department stores, international expositions, and non-professional publications like Popular Mechanics and Ladies Home Journal were enlisted in the promotion of architectural modernism. Then the Fair on the shores of Lake Michigan was opened, and countless Americans visited the row of model houses ... They found modern decoration good. For the country-wide popularity of the new style dates from the time they came upon it accidentally in Chicago, admired its simplicity, its directness, its straight simple lines and chunky forms, and most of all, its patent liveableness. Here was a different version of architectural modernism. Or, rather, a kind of modernity that did not rely on the universality and general applicability of modern architecture as much as it did depend on architecture's ability to (as Frederic Thompson would put it), "amuse the millions." The very idea that would make architecture the handmaiden of popular culture was architectural modernism itself. This, however, does not help us at all in identifying the "Home, Sweet Home of Tomorrow" portrayed in the September 1932 issue of Popular Mechanics. What it does do, however, is help explain why the magazine's editors would identify the house as one being shown at MoMA in 1932. The "Home, Sweet of Tomorrow" did bear a striking resemblance to examples of modern and Art Deco architecture, but it was only a resemblance. What was at stake was whether architectural modernism could be deployed to sell more magazines, more houses, and more tickets. That was the case in 1932 as much as it is now. Charles R. Richards, Art in Industry: Being a Report of an Industrial Art Survey Conducted Under the Auspices of the National Society for Vocational Education and the Department of Education of the State of New York (New York, 1922), p. 471. 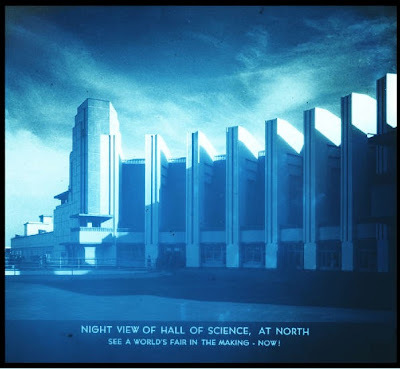 Architectural Commission of the 1933-1934 World's Fair to the Board of Trustees, 23 May 1928, quoted in Lenox H. Lohr, Fair Management: The Story of a Century of Progress (Chicago: Cuneo Publishing, 1952), p. 62. Lohr, Fair Management, pp. 75-76. C.W. Farrier, "Home, Sweet Home of Tomorrow?" Popular Mechanics (Sep., 1932), pp. 354, 128A. Historic American Building Survey, "ARMCO-FERRO-MAYFLOWER HOUSE: Photographs, Xerographic Copies of Color Transparencies, Written Historical and Descriptive Data, Reduced Copies of Drawings" HABS No. IN-244" (1994), p. 3. Ibid. 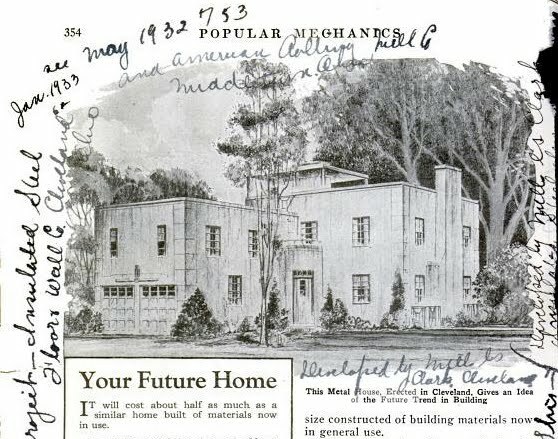 As our Popular Mechanics reader noted in the margin, the house from the May 1932 Popular Mechanics may have been built in Euclid, Ohio (not Solon), which would verify that it is indeed Robert Smith's frameless steel enamel house. Lloyd C. Engelbrecht, "The Association of Arts and Industries: Backgrounds and Origins of the Bauhaus Movement in Chicago", Unpublished Ph.D Dissertation, University of Chicago (1973), p. 122. This site is a great example of Modern Architecture and my students will benefit greatly from it. Great article. Great Calvino-like presence of the reader's handwritten notes. And great to see modern architecture alongside other popularizations of science. It strikes me what a different era that was, for popular science and for modern architecture. When modern architecture is used to sell things today, it's hardly with a reference to science, whether it's Dwell or Design Within Reach (in which case it's a kind of gallery mentality, easily explained by Bourdieu's theory of distinction). Perhaps the connection with environmental sensibilities could make the connection between popular concerns and cutting edge architecture work again? Thank you so much, John, for those links! I've been reading your site for a while, and now I'm glad there's more information available on Bullock's Wilshire!!! !